Since I’m less than a month out from my competition at the Europa Health and Fitness Expo, my cravings for sweets are starting to worsen. So far, I’ve gone five weeks without any sugar and have four more to go! I’m proud that I haven’t snuck anything and have had the will power to resist my sweet tooth. What better way to help my cravings than to bake! My boyfriend and our roommates were all home last night, so I thought it would be nice to whip something up for them. On a flight to Baltimore, for Expo East last year, I was served Biscoff cookies. That was my first time trying Biscoff cookies, but oh my…they were delicious! 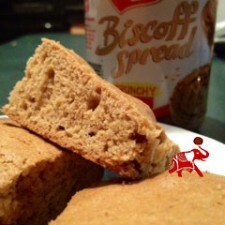 Come to find out, Biscoff actually makes a spread now! Last week, Erin brought a jar into the office that she didn’t want, so I took it home for the guys. I was looking through a recipe book trying to decide what to make for everyone and saw a recipe for peanut butter cookies. I thought to myself, I wonder what would happen if I’d replace peanut butter for Biscoff spread?! I had to try it! Well, come to find out, my cookie batter was more like a cake batter, so I put the mixture in a cake pan instead. I was completely okay with that though, since I was testing out what would happen. I must say, the end result looked SO good! Yes, this is a sugar filled treat…but it’s okay to splurge every so often. I also noticed that replacing coconut oil for butter in a 1:1 ratio made the bars extremely fluffy and the guys said they were super moist! At first, everyone was eating the cake bars plain, but I had this brilliant idea to dress the top with Biscoff spread. I had the guys try another piece of the cake bars with the spread on top and everyone said they were amazing that way! Preheat oven to 375 degrees and spray a cake pan with Kelapo Coconut Oil Cooking Spray. Place coconut oil and Biscoff spread in a medium bowl and whisk together for about 1 minute. Add the granulated sugar, brown sugar, baking soda, and baking powder. Whisk until combined, scraping the sides of the bowl. Whisk in the egg and vanilla until combined. Next, Whisk in the flour in small portions until completely combined. Transfer mixture to the cake pan and a timer for 12 minutes. Check the batter with a tooth pick to make sure it’s completely cooked. The booth pick should come out completely clean. If not, place back in the oven for an additional 3 minutes. Let the finished product cool and then transfer onto a plate. 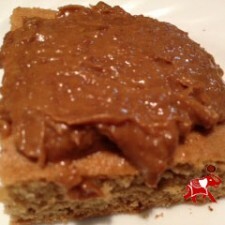 Cut into squares and cover with Biscoff spread. Serve and enjoy! From the feedback that I received from the guys, I will definitely be baking this recipe again after my show! I liked this recipe the most because it was so simple and didn’t take much time at all. I was able to create a dessert in under 30 minutes…perfect! Do you have any tasty recipes to make with Biscoff spread? In the steps it says to add in baking soda and baking powder, however in the ingrediants listed, it does not list baking soda. Dee, you just need ½ teaspoon baking soda for the recipe. Enjoy!